The University of Rochester recognizes that each faculty and staff member plays an important role in our University community, contributing expertise, skills of commitment to the institution’s motto of “Meliora.” We are proud to offer our employees many opportunities for Learning and Development. Workforce Learning and Development, in concert with a department's Human Resources Business Partner (HRBP), works directly with leadership and front-line managers to create a quality work environment through focused interventions, customized training sessions in support of those focused interventions, and system redesign. Workforce Learning and Development (both online and classroom) is also available on numerous subjects to assist staff including faculty, providers, and nurses in becoming more proficient in their job roles. MyPath is the Human Resource Talent Management System that is a companion system to HRMS. This robust cloud-based platform brings together performance management, employee learning & development, competency assessments and career planning all into one integrated suite of tools. Use the catalog to search for available learning opportunities. Click Here to access MyPath and then choose the applicable button to sign in. Education offered via MyPath online platform. Onboarding materials for new employee orientation. Education developed related to implicit bias, harassment and discrimination prevention. Classes address ways to reduce homophobia and heterosexism to make our institution a safer and freer environment for all members of our community. This program offers both instructor-led classes and online learning. The EAP Supervisory Training teaches managers and supervisors how to address concerns they have with those who report to them. 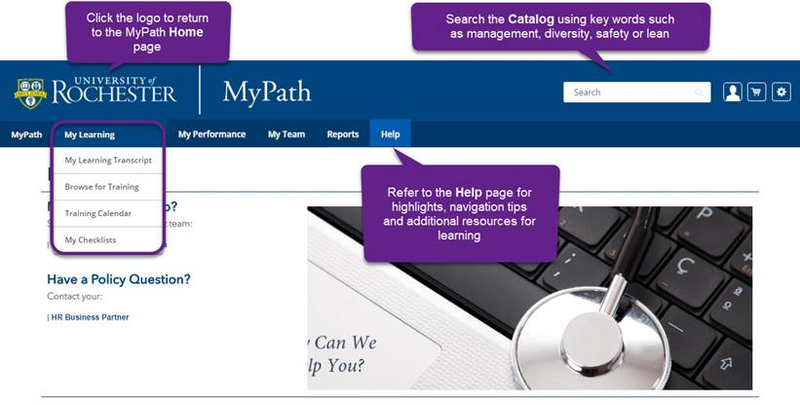 For general information, please send your inquiry to MyPath Support or Online Learning.